Delightful Repast is all about comfort food. And Cretons (pronounced kreh-tohn) – French Canadian Meat Spread – is one of the classic Quebecois comfort foods my husband grew up with. As with Tourtiere – French Canadian Meat Pie, Mr Delightful hadn't had this dish since his Mémé died many years ago. I decided to give it a try. Knowing Mr Delightful’s “texture issues” (he won’t touch pâté, hummus, guacamole, dips of any kind), I couldn’t quite believe that he ate and enjoyed cretons in his youth! With that in mind, I decided to make just a small batch. But I needn’t have worried. It was a hit! Especially on my toasted Homemade Sourdough Sandwich Bread. Though it is traditionally spread on toast and served for breakfast, we had it for lunch, since we nearly always have oatmeal and fruit for breakfast. Mustard and gherkins (cornichons would be good) are the traditional go-withs. I wanted to take an “in progress” cooking photo, but cretons really isn’t that photogenic while it’s cooking. But you can see in the photos of the finished product that I left it just a bit chunky. I thought of giving it a few licks with the immersion blender, which you can do if you want a smoother spread, but what with Mr Delightful’s aforementioned issues I thought I better leave it alone. Have you ever made, or had, cretons? For breakfast, or as an hors d’oeuvre? 1 In 2-quart saucepan, combine all ingredients except the breadcrumbs. Cook over medium heat, stirring with a large fork until the meat is broken up into crumbles and not clumping together. 2 Simmer, covered, for 2 hours. * Check it every half hour or so to make sure there is enough liquid, adding a little water if necessary. There was no need for me to add liquid as there was plenty of fat in the ground pork. * I just have to show you my new ThermoWorks Christopher Kimball Signature Timer. I've had it since October, and I think it's the best purchase I've made all year! Sleek and unbulky but with bigger buttons, and it's two timers in one. Great gift idea, too. I want to buy one for everyone! 3 Taste and adjust seasoning. Stir in the breadcrumbs. Cook, stirring, for another 5 minutes or so. 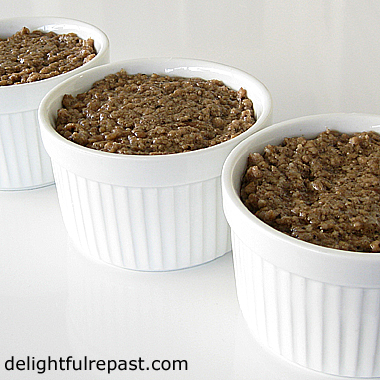 Pack into three 3/4-cup ramekins or in glass jars. Refrigerate for at least 4 hours or overnight before serving; keeps in refrigerator for several days. May be frozen for up to 3 months. Disclosure: Some posts contain links to my affiliate accounts at ThermoWorks and Amazon. If you purchase something through one of my links, I receive a small commission, at no additional cost to you, which I use toward the expenses of running this blog. Thanks for supporting Delightful Repast when you shop! Cretons is spanking new to me. Your column is always an education. And I’ll bet that particular mix would taste excellent if fried or re-fried (like refrijoles), maybe with another round of toasted breadcrumbs soaked in butter added. A dash of lemon juice or lime would set it up nicely thereafter. Sully, I like the idea of the dash of lemon or lime juice. It could fill the bill for the person who likes the sharp accent but doesn't like pickles. Thank you for another so interesting and tempting recipe of yours, darling Jean, actually my mouth is watering while I'm writing down your instructions to make it, you truly 'pamper' us ! 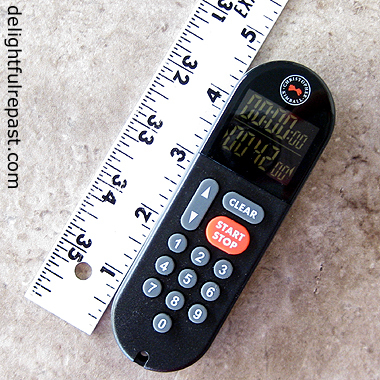 And let me add that your timer is really wonderful, so little and handy. Dany dear, thank you. You are so kind! Happy December! I have never had that food,it is new for me...Looks good!Hugs! It's new to me. My husband loves anything made with ground meat, bet he will love this too. I have never, ever heard of cretons, Jean, but I'm sure I would like it. How wonderful that you made it for your hubby, which I'm sure brought back special memories for him. Oh, I hope he does, Angie! Thanks! Kitty, thank you. He did appreciate the thought and really liked it! I have never had Cretons. I have made and do make tourtiere, or meat pies, or pate, whatever you want to call them every Christmas. 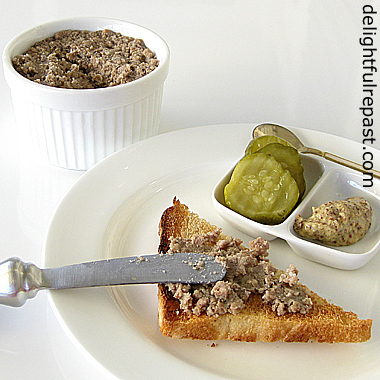 We call them Pate here which is an Acadian dish. Instead of baking so many individual pies like I used to, I will only make one big 13x9 dish with a bannock crust. We like it hot or cold. I won't have any family home this Christmas so it's the one big dish this year. I find when I use more beef and chicken, I can tolerate the bit of pork I put into it. I stay away from pork as much as possible because it doesn't agree with me. I love these "unusual" dishes you share, Jean! Thank you. Thank you, Sandi. If you can eat turkey, you could throw some ground turkey into the mix as well. I like the idea of the big pie with bannock crust! Sure looks like pate to me! Never had cretons eitheror tourtiere, although these are all kinds of variations on a theme, don't you think? Some neighbors are encouraging me to explore (and write about) a dish called "pig's stomach" -- sounds like a challenge! I didn't know that your hubby is Quebecois! This is the first time that I've heard of Cretons. I'll have to keep an eye out for it in case they're available in Ontario. I've heard of cretons but I've yet to taste let alone make them. Actually this sounds like a perfect, relaxed way to eat. I'm not sure about breakfast but it sounds ideal for a night in front of the TV. Rosemary, I don't think I'm up for THAT challenge! :D But if you take it on, please remember to send me a link! Margie, probably any French Canadian you meet could tell you about Cretons - it is ubiquitous! And even ones who don't have things like Cretons and Tourtiere on a regular basis probably trot them out for the holidays. Phil, does sound like a good TV snack! But, yes, cretons spread on toast and served with a fried egg or two is a typical Quebecois breakfast, or so Mr Delightful tells me! Jean - I love this recipe! My father‘s family is also French Canadian, although I have never heard of this particular dish. I can’t wait to make it – I think will be perfect for the holidays! David, thanks! That's wonderful - do let me know how it turns out for you! You're right, Martha. I think all my best childhood memories have at least something to do with food! It sounds delicious! I've never heard of this spread but I bet it would be great for breakfast or lunch. What a wonderful surprise for Mr. Delightful!! And I have to admit, I really like your little timer -- it reminds me of my shutter remote for my camera. Have a great weekend. Thanks, Marisa. It's a great party appetizer to spread like any pate on little crostini or crackers. Jeanie, I had my doubts, too! But I really liked it. If you like a meat loaf sandwich, you should like this. Have Rick give it a go! Perfect game day food when the Red Wings play the Maple Leafs, right?! This is new to me and sounds like something my hubby would enjoy. I'm not sure how my palate would react. Glad you hit the spot for your guy with this. Thank you, Ellen. Just so you know, I go very easy on the spices because my palate would not react well to sweet spices in meat unless they were very, very subtle. I'm all about subtlety! I've not heard of Cretons before, but it sounds a little like a meat pate. I love savoury foods for breakfast! Will be giving this a try! Lorrie, I hope you'll like it as much as we do. Instead of my usual oatmeal, I had some for breakfast yesterday with a cup of tea, and loved it. Our culture eat what in English is just called "Crackles" - it is all the tiny bits of cooked meat skimmed off when rendering lard. We eat it warmed up with brown or rye toast - it is very greasy & I never developed a taste for it, but Mr Shoes loves it. This sound like a much nicer version, and much less greasy too! Mrs Shoes, that's interesting - I've never heard of Crackles! Yes, this would be much less greasy. Mr Delightful said he doesn't miss the layer of grease on top that the Cretons of his childhood had. This is something I have never heard of, but it does sound delicious. My Mother used to give us 'Deviled Ham' from a can when we were young - spread on bread with a bit of mayonnaise and it was actually delicious. This sounds similar - something I know my husband would like. You are sweet for making your husband's childhood favorite! Thank you, Karen. I try to be "sweet" to him since he's pretty wonderful! Quinn, that's super! Let me know how it turns out for you. Thank you, Rue! I'm going to take some out of the freezer right now so I can have it tomorrow morning. I have never had this meat spread before, but look forward to trying your recipe. It looks like it would have a wonderful flavor and I love trying new foods! Hope you have a great week and thanks so much for sharing with us at Full Plate Thursday. Thank you, Miz Helen. AND thank you for hosting Full Plate Thursday! I've never heard of Cretons before it looks similar to pate I think. Thanks for sharing with us at #BloggersPitStop and have a lovely week. Muito bom aspecto. Deve ser delicioso. Feliz domingo. Sue, yes, I think of it as a pate. Thanks for hosting the Pit Stop! "French Canadian meat spread." Is that another way of saying,pate? The term French Canadian is not used so much in Canada these days, Jean. I think they call themselves,Québécois. Anyway, the term French Canadian sends a thrill of recognition down my spine. From the age of 5 until I was 18 I was taught by French Canadians in Southampton. French Canadians! Southampton? Its a long story I may tell you about one day. I have a great respect my old French Canadian teachers. They all came from rural farming backgrounds in Quebec. They were physically hard men who endured a lot in their lives. They were brave, intelligent,talented in so many ways and highly religious individuals. One French Canadian gave me my lifelong nickname, "The General." Ha! Ha! But that pate looks incredibly delicious. You show the way, Jean and I will follow. Tony, thanks. Yes, you can call it pate. Though not all French Canadians are in Quebec, Mr Delightful comes from a long line of Québécois. I've never thought of them in Southampton! I love traditional recipes like this, Jean! 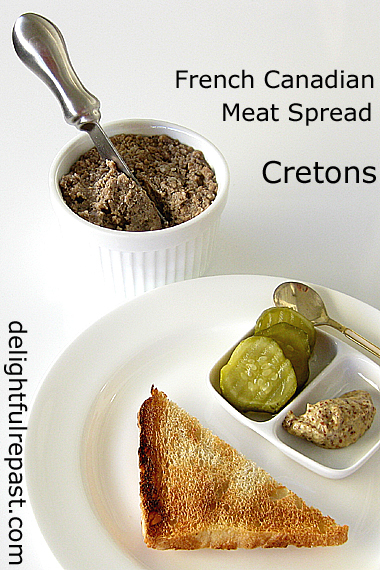 Your Cretons looks delicious - and such a versatile thing to have on hand as well! Thank you so much for sharing, and for being a part of the Hearth and Soul Link party. I hope you are having a lovely week so far! Thank you, April. We've had a no-time-to-cook week and have been relying on my homemade freezer meals. Yesterday I thawed a frozen pot of Cretons and had it for dinner on homemade sourdough toast with a couple of easy vegetables. Thank you, Greg. Yes, I was glad, too. He said it was even better than his Aunt Rosa's! What a fun dish! I've never had this (and obviously haven't made it), but it sounds really good. A lunch or dinner dish for me, though -- just can't eat that much first thing in the morning! Good stuff -- thanks. Thanks, John! Yes, I'm not ready to eat a lot of food first thing in the morning either. We actually had it for dinner just the other night.